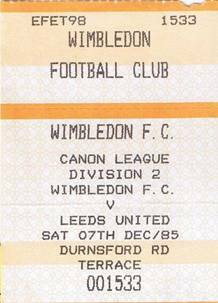 Date: Saturday, 7th December 1985. Score: Wimbledon 0 Leeds United 3. Scorers: Wimbledon: Nil. Leeds United: Snodin, Baird, Dickinson. 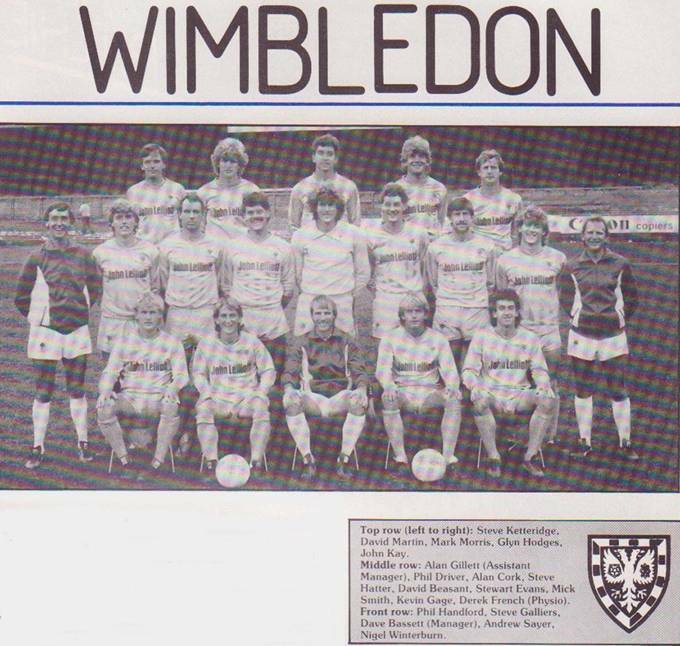 Wimbledon: Beasant; Kay, Winterburn; Galliers (Cork), Morris, Thorn; Evans, Fishenden, Fairweather, Sanchez, Hodges. 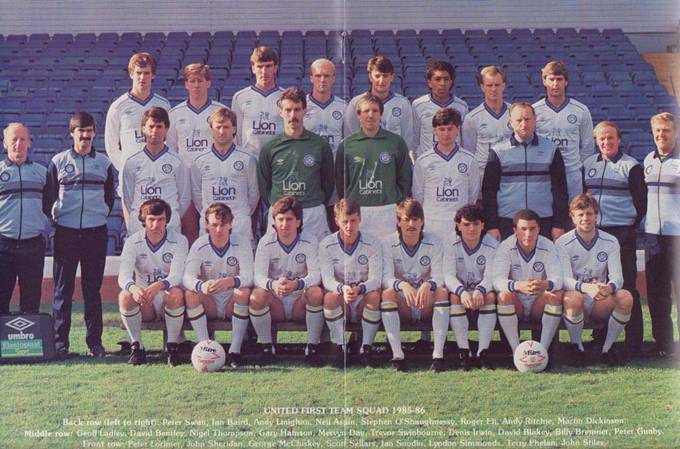 Leeds United: Day; Caswell, Robinson; I. Snodin, Aspin, Linighan; Ritchie, Sheridan, Baird, Hamson, Dickinson. Referee: Mr D. Ashworth (Rutland). 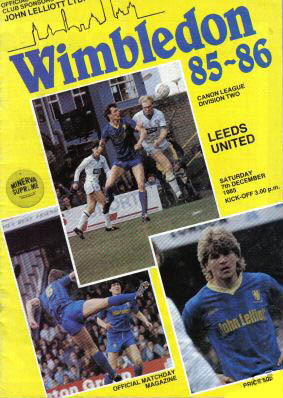 Wimbledon were unbeaten at home in League games and standing fifth in the Second Division when Leeds United stepped out at Plough Lane to bring off a shock 3-0 victory. Neil Aspin’s blood-drenched shirt summed up the competitive nature of the game which saw Ian Baird, who had scored one of the goals, and a fine one at that, given his marching orders towards the end. United had suffered a blow when talented midfield man John Sheridan was ruled out with a hamstring strain received in training the day before the game and recently appointed United manager, Billy Bremner, had warned his men they were likely to need tin-hats and helmets to deal with Wimbledon’s much maligned ‘high rise’ style of play. “It is going to be like the Alamo,” he said before the game and when play got underway his words seemed to have been well-chosen. 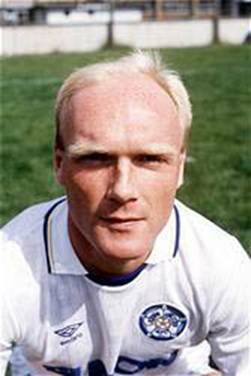 Wimbledon threw everything at United early on, but Neil Aspin, who was playing his first game after a four week injury absence, produced a typically gutsy performance and suffered a nasty gash over his right eye for his efforts. 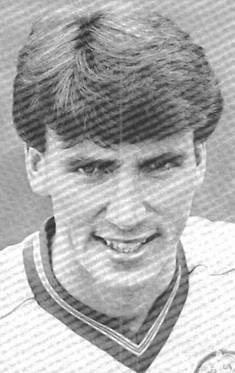 Aspin’s all action display brought the best out of Andy Linighan and full-backs, Brian Caswell and youngster Ronnie Robinson, but the star of the show, particularly early on when Wimbledon surged forward, was goalkeeper Mervyn Day. Although he was booked in the third minute for a tackle on striker Paul Fishenden, when he raced out of his area, Day went on to earn ‘Man-of-the-Match’ status with a commanding display, even saving a twenty-eighth minute penalty. After battling through those early Wimbledon raids, United produced some good football, a class apart from the home team. Ian Snodin buzzed around in encouraging fashion and it was he, after receiving a pass from Andy Ritchie, who put United on the winning path with a beautifully worked and executed goal after thirty-eighth minutes. Ritchie played a part also in the build up to the second goal three minutes before half-time, when his well struck left-wing cross found Ian Baird, who bravely headed in. Ian Snodin’s free-kick and good work by Ian Baird set up Martin Dickinson for the third goal just three minutes into the second-half to round off the scoring. Baird’s departure came in the seventy-seventh minute, when he was sent off for what the referee claimed was spitting at an opponent, an accusation denied by the player. Mervyn Day gave thanks for one moment of leniency from the referee with an inspirational display which turned around Leeds United’s fortunes under their new manager, Billy Bremner. 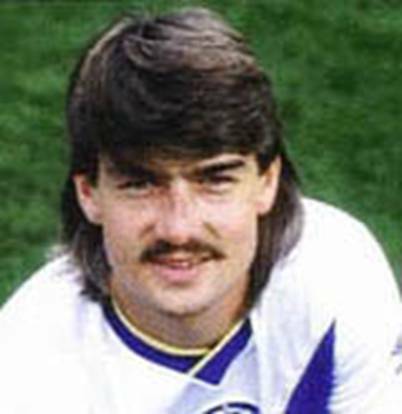 Mervyn Day hacked down Wimbledon’s striker, Paul Fishenden, outside his area after only five minutes, and was fortunate only to be booked. 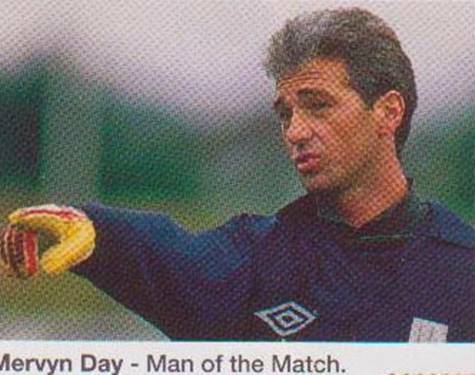 After five minutes Day flung himself full stretch to push Glyn Hodges twenty-five yard shot around the post for a corner and minutes later he made a magnificent one-handed save to deny Nigel Winterburn. 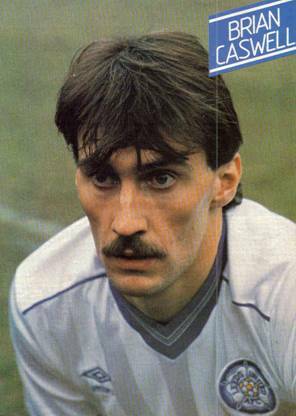 It was no surprise as he stopped Paul Fishenden’s twenty-eighth minute penalty after a foul by Gary Hamson. This seemed to be the turning point for Leeds as they got their act together. With their first real venture into the Wimbledon half, they scored. What a lovely effort it was. Mervyn Day’s booming kick was flicked on by Andy Ritchie to Ian Snodin, who beat his man and hammered the ball into the back of the net. Andy Ritchie was again in the thick of the action two minutes before the break. Picking up Gary Hamson’s quick throw on the left, he whipped over a cross for Ian Baird to crash home the second. Within two minutes of the start Leeds were three goals to the good. 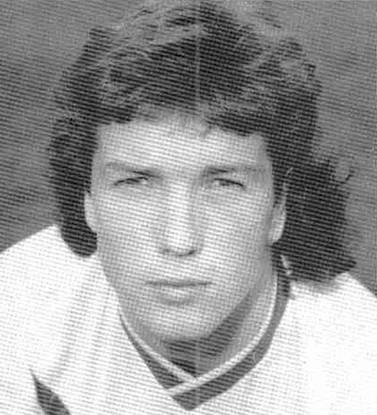 Ian Snodin’s free-kick picked out Martin Dickinson, who stroked the ball past Dave Beasant at close range. The goal seemed to kill the match, which deteriorated into a succession of free kicks and a number of off-the-ball incidents that the referee, John Ashworth, did not see. It was the sharp eyes of a linesman that led to Ian Baird’s seventy-sixth minute dismissal for ungentlemanly and violent conduct. 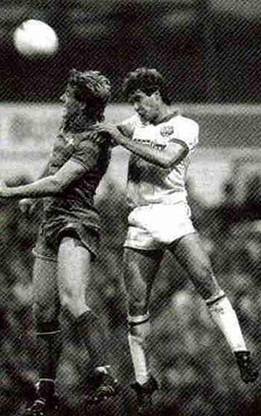 Baird punched and spat at Wimbledon’s young sweeper Andy Thorn and as the final whistle blew Billy Bremner came on to the pitch to usher away Ian Snodin, who had been involved in a running battle with Glyn Hodges. 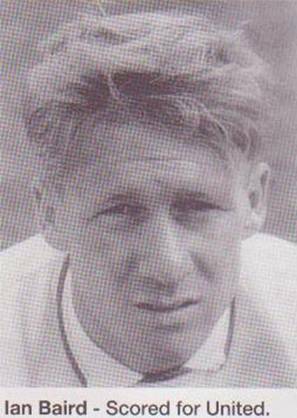 Ian Snodin, Ian Baird and Martin Dickinson scored for Leeds. Ian Baird also got sent off.